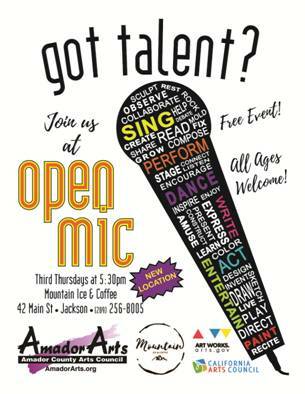 Everyone is welcome to perform at the Third Thursday Open Mic Night in Jackson, July 19, from 5:30 to 7:30 pm at Mountain Ice & Coffee at 42 Main St. Presented by AmadorArts and MC Scotty Coleman, this family-friendly free Open Mic Night is a good way to spend the hottest part of the day, usually. Individuals are welcome who feel they’re ready for an audience to perform dance, singing, musical theatre, Shakespeare, poetry, oratory, instrumental music, from violins to ukuleles, ​comedy, and improv. And, they need an audience. So, come and be entertained! Group Art Analysis also is a fun monthly part of Open Mic, in which a local visual artist brings in an artwork and guests take a stab at discussing it, all in fun. Culinary arts will be present too, such as Temple Coffee, roasted in Sacramento, and rated one of 17 of the nation’s best small coffee makers; Dreyers Ice Cream; and Kneading Dough’s locally baked goods. Relax in the comfy couches and chairs.